Jack Alexander Simmons was born March 17, 1924, at Morningside Hospital, now Hillcrest Medical Center, in Tulsa, Oklahoma, to Homer Alexander and Georgia Genevieve Tisdale Simmons. 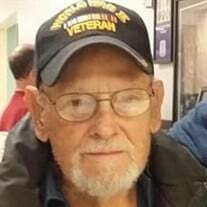 He died Wednesday, April 10, 2019, in at the Claremore VA Center in Claremore, Oklahoma, at the age of 95 years. Jack was reared and educated in Tulsa, Oklahoma, and was a graduate of Central High School. He was a veteran of the armed forces having served his country honorably with the United States Army Corp of Engineers 291st Combat Division during World War II. Jack sold magazines in downtown Tulsa while working for his father in his barber shop. He was married July 17, 1948, in Tulsa, to Velma Marie Reed. He continued the barber business after his fathers passing as Simmons Barber Shop. He was a faithful member of Brookside Baptist Church in Tulsa. Jack enjoyed a variety of pastimes including fishing and playing Farkle. He especially enjoyed traveling and taking trips vacationing. Koby, Cassidy, Tanner and Cole. Visitation will be held from 1:00 p.m. to 5:00 p.m. Sunday, April 14, 2019, at Mowery Funeral Service in Owasso. Funeral service will be held 2:00 p.m. Monday, April 1, 2019, at the Memorial Park Cemetery Chapel in Tulsa with interment to follow. Arrangements and services were entrusted to Mowery Funeral Service of Owasso.